Agbotic Farms began in 2014 when the three owners—Richardson, Cody Morse and John Gaus—created a prototype green house in which they could grow organic baby produce in soil year-round. Their innovative technology is engineered to have environmental control over their product 24 hours a day, 365 days a year. This allows produce to grow in nutrient-rich soil, yielding a flavorful product. The farm’s food is organic and Good Agricultural Practices (GAP) certified. According to the U.S. Department of Agriculture, GAP means the produce is grown, handled and packaged in such a way that reduces the risk of microbial food safety hazards. From seed to harvest, it takes 22 days to grow a single baby radish. On the 23rd day, Food Services is able to serve the baby roots on the campus salad bars. “This benefits Syracuse University because students are able to have the fresh greens in the dining centers within 24 hours of harvest,” Richardson says. To maintain their quality, Agbotic Farms sells only to companies that they are able to deliver to within 24 hours of harvest. 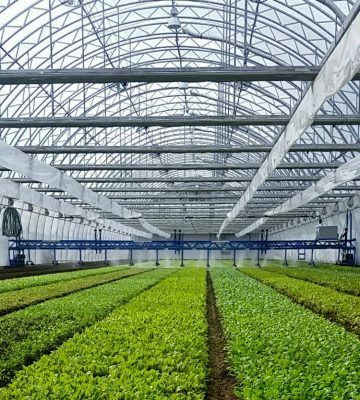 Currently, Agbotic Farms has one fully functional greenhouse, with the structures for five additional greenhouses and a wash-and-pack facility in place. The company plans to have all its greenhouses up and running by the end of August. Other expansion plans include hiring more than 20 new employees and expanding to grow other baby root produce like carrots and turnips.